Tinytags monitor temperatures in server rooms, and throughout the workplace as part of an environmental sustainability audit. 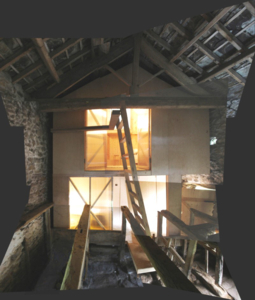 An architectural practice uses the recorded data to assess its heating/ventilation methods and energy usage, and also as part of a separate research project monitoring conditions while refurbishing barn buildings. Feilden Clegg Bradley Studios are an award-winning architectural practice with experience in designing for education, housing, art, master planning and urban design, as well as for the creative reuse of historic buildings. Tinytag Transit 2 temperature loggers were used in the server/print rooms within the Practice offices (situated within a Grade II listed building) to determine peak internal temperatures. This was predominantly to determine the success of different fresh air/passive cooling methods and to see if use of air conditioning plant could be avoided - which the results of the monitoring showed it could not. The data loggers were also used as part of a wider sustainability audit of the premises to determine heating/ventilation methods and energy usage. In addition, FCB used two Transit 2 loggers and an Ultra 2 temp/RH logger as part of a practice-funded research project looking at sustainable re-use options for redundant agricultural field barns in the Yorkshire Dales. The aim was to insert a free-standing 'eco-pod' into a repaired barn, providing holiday accommodation, conserving these historic structures while generating a source of income to the rural economy. A prototype test-build 'pod' interior was constructed, and data loggers installed to measure internal, external temperatures and RH. This helped to help determine the efficacy of thermal insulation specification and the air-tightness/environmental performance of the new interior spaces. Recorded data allows both a basic interpretation of peak temperature and relative humidity levels, combined with a more detailed interpretation in conjunction with M&E Engineering consultants. Richard Collis, Partner of Practice and Architect/Conservation Architect at FCB chose the Tinytags for their robustness and long battery life - which allowed long-term recording on an unoccupied project site - and for being inconspicuous. He comments, "They are great pieces of kit that do exactly what they are meant to!" The image shows the field barn 'pod' interior. Monitor indoor environmental conditions with a Tinytag Ultra 2 temperature and relative humidity data logger.